There are 3 indicators for the money supply, M1, M2 and MZM. M1 is the narrowest. MZM is the broadest. M2 is in the middle. “M1 is the money supply of currency in circulation (notes and coins, traveler’s checks [non-bank issuers], demand deposits, and checkable deposits). A decreasing velocity of M1 might indicate fewer short- term consumption transactions are taking place. We can think of shorter- term transactions as consumption we might make on an everyday basis. The broader M2 component includes M1 in addition to saving deposits, certificates of deposit (less than $100,000), and money market deposits for individuals. Comparing the velocities of M1 and M2 provides some insight into how quickly the economy is spending and how quickly it is saving. Here we compare the two broadest measures, M2 with MZM, year over year % change. The bottom line is that the general velocity of money supply is declining throughout this business cycle. That is a continual drag on prices and output. Using my model of core inflation, nominal rates, profit rates, labor share & capacity utilization, here is a graph of the present situation. The estimated natural real rate for this graph is 1.7%. 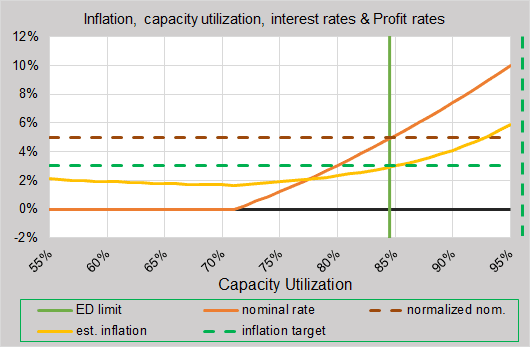 The vertical dashed green line shows where capacity utilization is now at 75.2%. The solid red line shows the path of the estimated Fed rate. The Fed rate now sits at 0.3%. 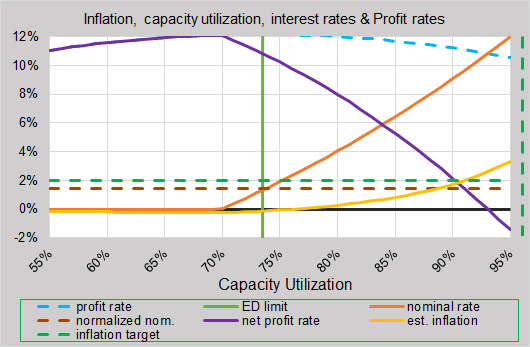 The model says that if capacity utilization goes to 76%, the Fed rate would go to 0.8% in order to stay on path to normalization. Antonio Fatas poses a very good question. You can lower interest rates, but can you raise inflation? I stop right there. For me, there are forces that the central banks cannot counteract. And the new model is revealing some preliminary mechanism to show how. I applied the model to Japan’s situation of low inflation and low nominal rates. 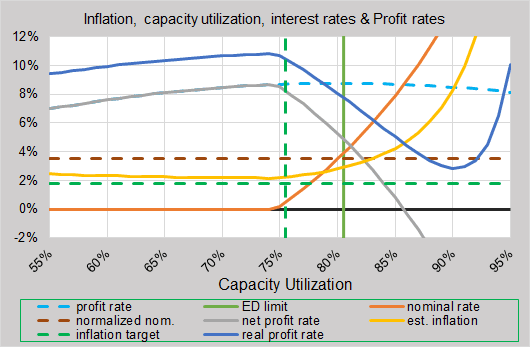 The model builds on the idea that capacity utilization is a force that affects inflation. 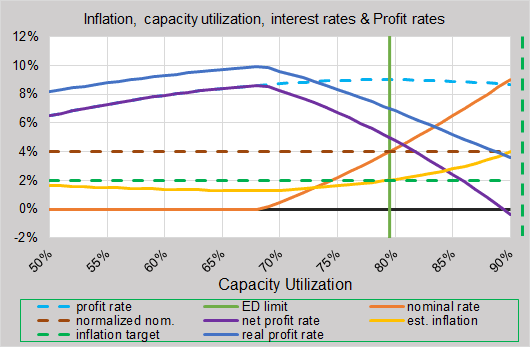 The current low capacity utilization is a force to push down inflation. Another force is net profit rates (corporate profit rates – nominal rates). High net profit rates also push down inflation. Another force is labor share. The current very low labor share in advanced countries, including Japan, leads to an environment where inflation wants to go lower. So now I input some preliminary data into the model for Japan. Core inflation hovers on the edge of deflation the whole time up to the natural limit. Even by keeping nominal rates low, inflation still stays low. Antonio Fatas talks about forces. Here we see the forces at work. Now I solve for the inflation target that brings monetary policy into balance with the forces. Look at the horizontal dashed green line of the inflation target. It now sits at -0.3%. The model shows that a mild target of deflation is the best monetary policy to balance the forces affecting inflation. The model reflects the situation in Japan. Loose monetary policy cannot counteract the forces that want to go into balance at a mild deflation level. Keep in mind that the model probably needs some tweaking to get coefficients right, but the model can explain forces that Antonio Fatas mentions. The success of Abenomics depends upon raising labor share. A higher labor share would raise the balanced inflation target. I and others have said this from the beginning. This model gives a logic behind the view.. 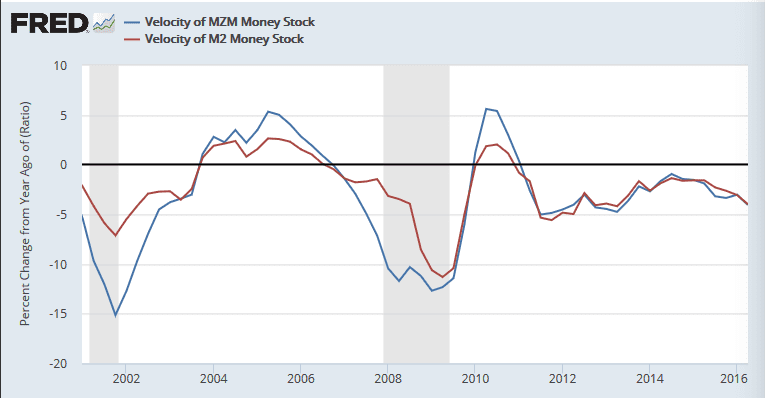 In case you missed it, like I did, the velocity of the M2 money supply is declining more quickly. That normally indicates that the economy has taken the turn toward an eventual contraction. Could an Inflation Target depend on Labor Share? 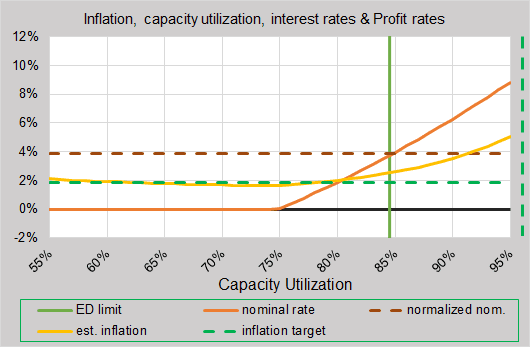 I continue to explore the model that I posted this morning extending a relationship between inflation and capacity utilization. The model shows that labor share would determine the most balanced inflation target… and the inflation target then becomes variable depending upon the how labor share changes in the economy. Remember, it was once thought that labor share was pretty constant. Now that it has fallen so much over the past 15 years, we can study its impact better. One can read the previous post to see how the model is built. I want to focus on two points in the model. The crossing point of the nominal interest rate (solid red) and the normalized nominal rate (dashed red line). The crossing point of estimated inflation (solid yellow) and the inflation target (dashed green). Both of these crossing points should occur at the natural limit (vertical green line). They should define balance at the natural effective demand limit. Greenspan did a good job of getting these two pairs of lines to cross where they should at the natural limit back in the 90’s. We are far from doing it now. But how can it be done? The answer is in labor share. In the graph, the first pair of lines cross at 5% at the natural limit (vertical green line) as they should, but inflation is coming in below target at the natural limit (yellow line below dashed green). The dynamics of the relationships are calling for a lower inflation target to have balance at the natural limit. Now I lower the inflation target to 1.84%. Now the two pairs of lines cross perfectly on the natural limit. What is interesting is that effective labor share was around 75% in this business cycle, implying that an inflation rate below 2% was balanced. That is what we have been experiencing. Now what if we wanted to always have an inflation target of 2%, but let effective labor share rise back up to 80%? Now we see that inflation wants to be above target at the natural limit (yellow line is above the dashed green at the vertical green line). So now I raise the inflation target to 3%. Now the two pairs of lines cross perfectly in balance at the limit. The model says that as labor share rises, the inflation target should rise too so that the Fed rate and inflation arrive at the natural limit in balance with monetary policy. So in order to have balance, we need to be able to adjust the inflation target as needed. Or could it be that an inflation target itself drives labor share and inflation toward the balance point? Just a thought blowing in a brainstorm. So is their a relationship between labor share and inflation? Here is a scatter plot of actual quarterly data since 1967. Lo and behold! There is a relationship between labor share and inflation. And it fits the model… I love discovering hidden secrets. According to the trend line of past data, an effective labor share of 75% would call for an inflation target around 2%. This is close to the model I am presenting. And an effective labor share of 80% would call for an inflation target around 3% to 3.5% which is also close to my model. If effective labor share ever gets back up to 84%, an inflation target of 5% to 6% would be called for. If we tried to keep even a 3% inflation target, inflation would constantly be trying to rise above our target in an uncontrolled way… 1970’s anyone? The high data points from the 70’s may be just from a dynamic of high labor share that wanted inflation above an inflation target that was too low at the time. Then there could have been two basic ways to solve the high inflation. Raise the inflation target, which would have been even less acceptable. Now low inflation in the advanced world may simply be a dynamic result of labor share being forced down around the world. So there you have it… Which came first, the inflation target or the inflation? Well, that could depend on effective labor share. I have been in the workshop building a model for inflation and other things. It builds upon the model for forecasting the profit rate cycle. And also upon the model for the relationship between inflation and net profit rates. The model was provoked by a video from Khan Academy on youtube. This model has many working parts so I will build it slowly. 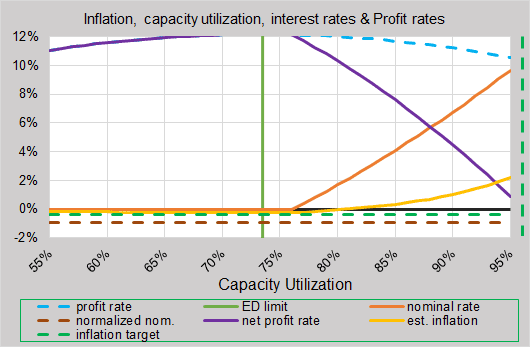 When profit rates peak in the aggregate, we have reached the effective demand limit. Capital utilization has been optimized. 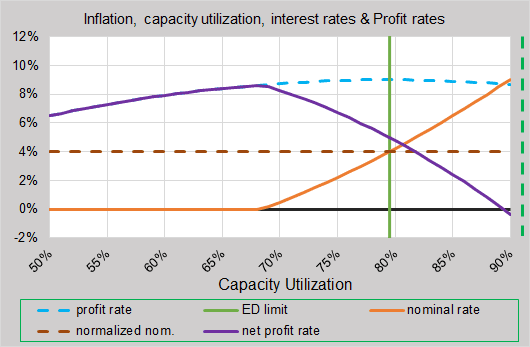 Think of the effective demand limit as the Natural limit of the business cycle in terms of capacity utilization, not full employment of labor. 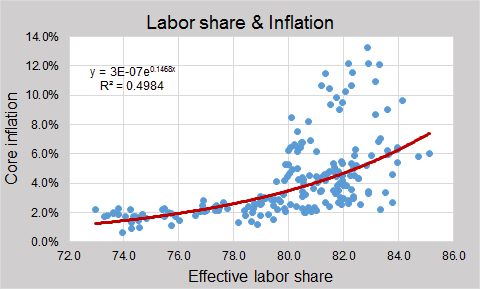 s = effective labor share, (0.76 * Non-farm labor share index), s = 75% for graph. 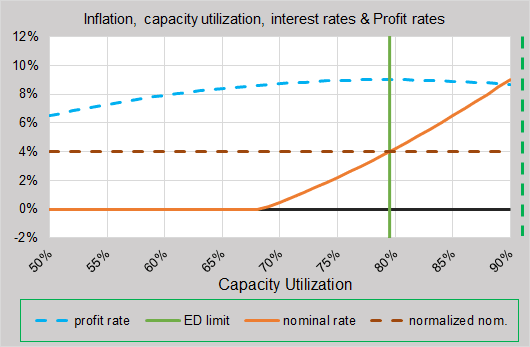 Capacity is optimized at the effective demand limit. 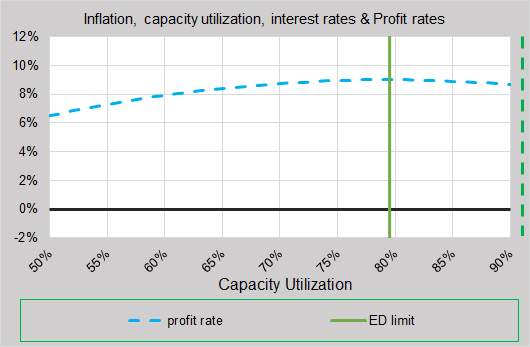 Capacity utilization does not like to go beyond the effective demand limit because profit rates fall. This is the pattern since 1967, the year data for capacity utilization starts. Now I add in the equation for estimating the Fed funds rate path based on the effective demand limit. The orange line sets an appropriate rate for the Fed funds rate based on the cycle of effective demand. However, that rate can change as the forces around inflation change. I will discuss this a bit later below. Note how the orange line crosses the effective demand limit at 4%, which is the natural real rate plus the inflation target. So the Fed rate is modeled to be normalized at the effective demand limit. I have drawn in the normalized Fed rate line at 4%. Now I add in the net profit rate. Net profit rate drops as the Fed rate rises. Now I add in the trend of core inflation. Inflation is estimated from the net profit rate, n. See this post for example of equation. The coefficients above were chosen to weed out some of the effect of the Volcker recession and to make inflation cross the effective demand limit at the inflation target of 2%. Note that inflation is less than the 2% target to the left of the effective demand limit. The equation above for the estimated Fed rate assumes that inflation is on target at 2% because no adjustment is made in the equation for inflation off target. 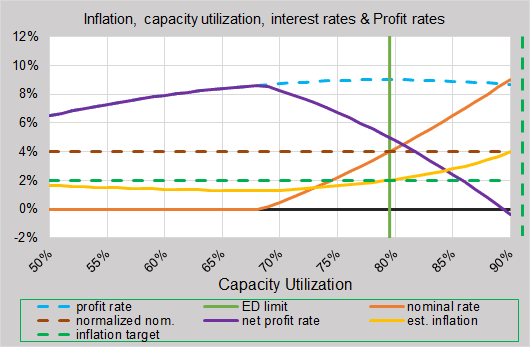 The implication is that there is a tendency for inflation to want to go below target when capacity utilization is low and when net profits are high. 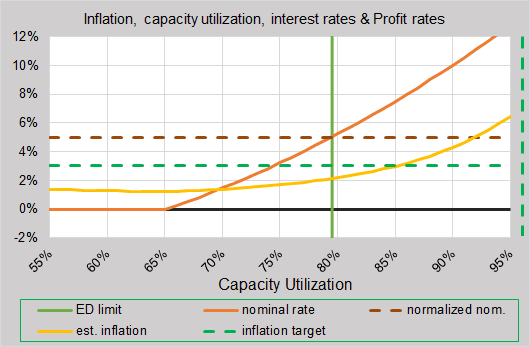 The main point of the video by Khan Academy is that inflation tends to rise when capacity utilization is high. I would add that net profit rates need to be low too. 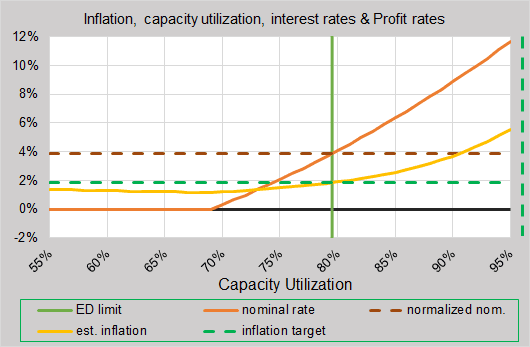 The other point in the video is that inflation will stay low when capacity utilization is low. I would also add that net profits need to be high. Here is how the graph changes just after two iterations if the Fed rate tries to adjust to the tendencies of inflation to be off target. First, note how the Fed rate waits longer to start rising off of the zero lower bound. Look familiar? Then it has to rise faster to normalize. 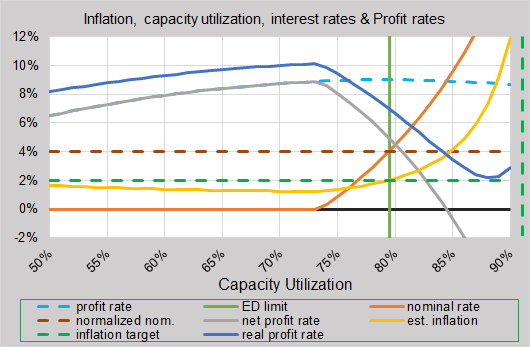 Inflation drops just a bit when capacity utilization is below optimal, and rises much faster when beyond optimal. The current stubborn low inflation reflects this model. Many people criticize the Fed for keeping the Fed rate too low as a recovery gets going, but there is a reason to their madness. They are dealing with forces that try to push inflation lower. Especially now since capacity utilization is very low and net profits are very high. Both add to pressure to keep inflation low. The problem with the Fed is simply that they do not know where the effective demand limit is. More important than the net profit rate is the real profit rate. Firms look at this in order to invest, set prices and manage their profits. Firms keep the real profit rate above zero. The aggregate real profit rate does not like to go below zero. So you see it dropping toward zero beyond the effective demand limit. Here is the same graph above adding the real profit rate when the Fed rate tries to adjust to strong forces pushing inflation off target. 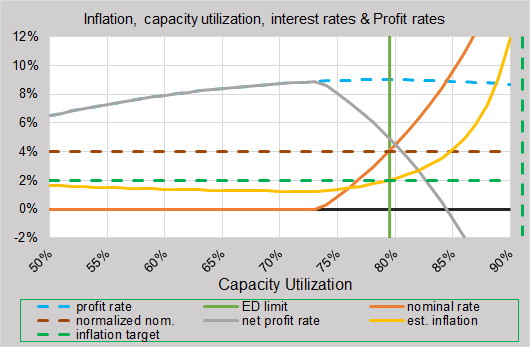 The real profit rate will drop faster around the effective demand limit as the Fed rate rises faster. Then inflation will rise faster on the right of the ED limit to keep the real profit rate positive. In the graph, the real profit rate slams on the brakes and starts rising again as inflation keeps it above zero. Aggregate profit rates are still dropping, but an immature economy may simply keep increasing capacity utilization as long as the real profit rate is positive. The result is high inflation. The model extends the view of the forces pushing inflation off target. The foundation of the model is the cycle of the aggregate profit rate. What do you get if you mix Donald Trump and Donald Duck? I see that Ben Bernanke talks about how the Fed’s views of the economy are changing, in particular that the Fed funds rate at the Natural level of production (Terminal as Bernanke puts it) is being revised downward in the past year. This agrees with my research into effective demand. 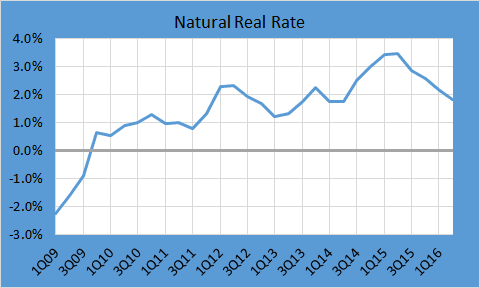 I see that the Natural real rate has been slipping for a year. This would bring down the Terminal funds rate. I take that a bit further. A drop in the terminal funds rate brings down the estimation of the Fed funds rate from my effective demand research. In effect, monetary policy is tightening toward a point that would trigger an economic contraction. 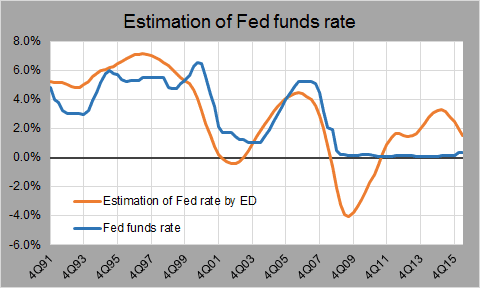 Economic contractions coincide when the Fed rate (blue line) goes over the effective demand estimate (orange line). At this point in time, the orange line is dropping as it did before the two previous recessions. The current situation looks similar to the late 90’s when the Fed rate stayed consistent as the orange line dropped below it. If there are further declines in the estimate and the Fed decides to raise the Fed rate and the orange line drops below the blue line, it would signal that an economic contraction is forming. Policy seeks to increase activity in spite of weak effective demand for output. So is it any surprise that zero-lower-bound monetary policy has not normalized the economy? If only economists would understand Effective Demand as a limit upon utilization of labor and capital… then they would understand stagnant productivity. Trump is Psycho Weird: Voting Rigged? … Hillary is the Devil? More character defining moments of a psycho person. He says if he loses Florida 3 months from now, because polls show him winning now… It is proof of voting fraud and there will be widespread civil disobedience and a constitutional crisis. If Bernie made a deal with the devil by supporting Hillary, then maybe, just maybe, the republicans who are now supporting Trump against their own principles, in order to be good republicans, are also making a deal with the devil? He is a reflection of what the republican party has become.